Miami Trace’s Krissy Ison makes the running catch in centerfield during a Frontier Athletic Conference game against Jackson Wednesday, April 10, 2019 at Miami Trace High School. 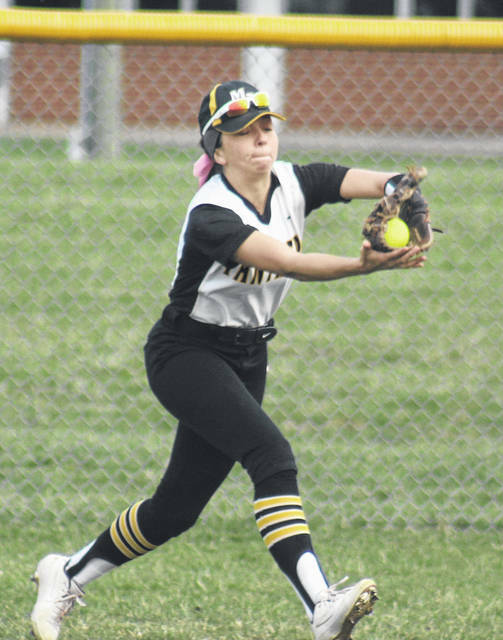 It was a meeting of the top two teams in the Frontier Athletic Conference when the Ironladies of Jackson High School, the defending FAC champions, visited Miami Trace High School to take on the Lady Panthers Wednesday evening. Just 24 hours earlier, Miami Trace slugged its way to a 14-4 win over East Clinton. Miami Trace had 13 hits in that game, five of them leaving the yard. On Wednesday, Jackson pitcher Taylor Evans authored a two-hit shut out as the Ironladies came away with a 7-0 victory. Evans did not walk a batter over seven innings and struck out 10. Olivia Wolffe started and suffered the team’s first loss. She pitched six innings with six hits and four runs. She walked two and struck out five. Maddie Mossbarger pitched one inning with three hits and three runs, no walks or strikeouts. Wolffe hit a triple and Cassidy Lovett had a single for Miami Trace. K. Newkirk led Jackson, going 4 for 4 with a double and four rbi. L. Alford was 3 for 4 with a double, a triple and three runs scored. “That’s a good team,” Miami Trace head coach Joe Henry said of Jackson. “They hit the ball well. They have a good coach. Miami Trace (8-1 overall, 3-1 FAC) is off Thursday and will host the Lady Blue Lions of Washington High School Friday at 5 p.m.
Washington lost to McClain Wednesday, 13-1. Offensively for Miami Trace: Kaylee Hauck, 0-3, sac; Olivia Wolffe, 1-3, 3b; Jessica Camp, 0-3, fc; Ashley Campbell, 0-3; Sidney Payton, 0-3; Cassidy Lovett, 1-2; Breanna Eick, 0-1; Aubrey Schwartz, 0-3, fc; Maddie Mossbarger, 0-2; Kylee Rossiter, 0-2. Offensively for Jackson: S. Humphreys, 1-4, 1 run; L. Alford, 3-4, 3 runs, 2b, 3b; K. Bako, 0-4, sac fly, rbi; K. Newkirk, 4-4, 1 run, 2b, 4 rbi; T. Evans, 1-4, fc; J. Bond, 0-0, 1 run; M. Humphreys, 0-4, bb, 2 roe; M. Baxter, 0-4, hbp, sac, 1 rbi; K. Kight, 1-4; G. Webb, 0-3, 1 bb, 2 sac.